Elisabeth Noelle was born on December 19, 1916, the second of four children of Eva and Ernst Noelle, who lived at Schillerstrasse 14/15 in Berlin Charlottenburg.1)Family chronicle by Eva Noelle, Private Archives Elisabeth Noelle, Piazzogna. Ernst Noelle studied law in Berlin, Freiburg, and Paris. 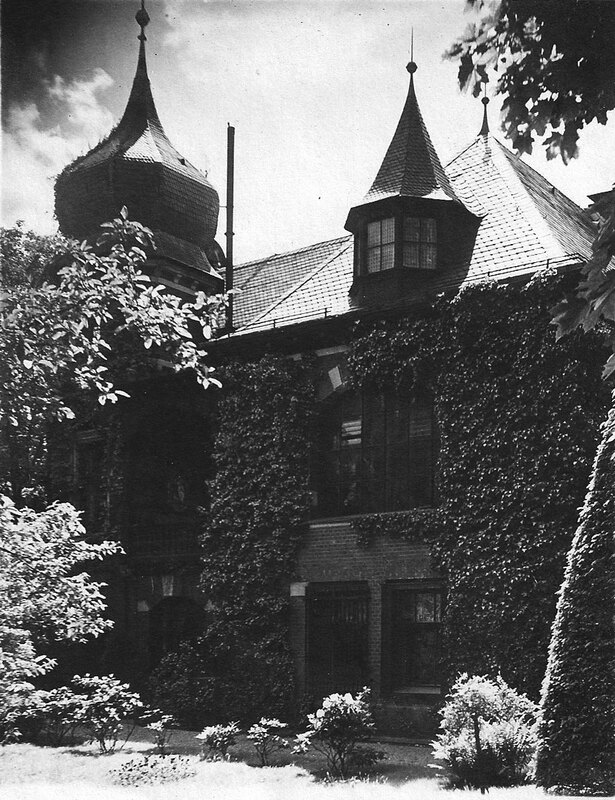 After obtaining his doctorate in Heidelberg, he worked in the steel construction company Steffens & Noelle, which his father Ernst Noelle Sr had co-founded in 1893. During World War I, Ernst Noelle Jr served as a reserve lieutenant consecutively in the 16th Uhlan Regiment, the 16th Infantry Regiment, and the Weapon and Ammunition Procurement Center in Berlin. After the war, Ernst Noelle Jr served, among other positions, as a board member of Tobis, the most important German film production company apart from UFA back then, and as a board member of Associated Sound Film Industries in London.2)Résumé of Dr. Ernst Noelle, undated, Private Archives Elisabeth Noelle, Piazzogna. Eva Noelle, on the other hand, came from a family of artists: She was one of four children of the sculptor Fritz Schaper. His most well known works of art include the Goethe monument in the Tiergarten in Berlin, the Christ statue in the museum of the Emperor William Memorial Church in Berlin, the “Prussian Madonna”(Queen Louise), the Victoria in the main lobby of the German Historical Museum in Berlin, the gable-relief of the Reichstag in Berlin (house of the German parliament), the Lessing monument in Hamburg, as well as the Luther monument in Erfurt. Buchenstrasse was closed, three state coaches drove up, and the Emperor came in order to take a look at the new pieces of art in the atelier. On such festive occasions, the children used to stand in line in the vast, dark entrance hall to greet the Emperor. Later, they observed from the second floor through the curtains how the Old Germanic Bison Hunt or the Great Elector were rolled out on rails in the garden for the Emperor. Emil Rittershaus’ daughter Adeline Rittershaus-Bjarnason, a specialist in Scandinavian literature and campaigner for women’s rights, the first woman lecturer at the Faculty of Philosophy I of the University of Zurich in Switzerland, was a grand-aunt and godmother of Elisabeth Noelle-Neumann. The previously sketched connection to Emperor William II and the Hohenzollern family might suggest that Elisabeth Noelle-Neumann’s socialization was imprinted with conservatism and loyalty to the Emperor. However, the historical events and changes of that epoch were mirrored in many ways in the different members of the Noelle and Schaper families, which meant that Elisabeth Noelle-Neumann was exposed to diverse and partly contradictory influences. Wolfgang Schaper married Elsbeth Bieber, called Yvonne, whose family was of Jewish descent and who brought three boys from her first marriage into the new relationship – this marriage also meant a conscious breach of conservative conventions. In 1928, their son Peter Wolfgang, called Woelf, was born in Berlin. Two years later, Wolfgang Schaper, then 35 years old, died of the consequences of his war injury, which had required a leg amputation. In 1946, Yvonne and Woelf Schaper emigrated to the U.S.14)Hilde Schramm: Meine Lehrerin, Dr. Dora Lux. 1882-1959. Nachforschungen (pp. 200-202; 272-274). Rowohlt, Hamburg 2012. For both of them, the emigration represented a deliberate dissociation from the cultural traditions that had culminated in National Socialism. Shortly after their arrival in the U.S., Yvonne began to work for Albert Einstein and his family in Princeton: She looked after his sister for about two years. 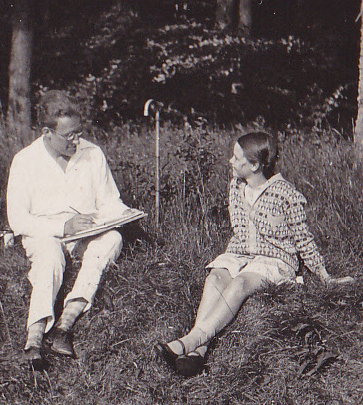 The connection to Albert Einstein and his family had been established by the mathematician Hermann Weyl and his wife Hella whom Yvonne Schaper had met in Zurich at the end of World War I and with whom she had been friends ever since. From Princeton Yvonne Schaper sent American literature on public opinion polls, which was unavailable in Germany, to Elisabeth Noelle-Neumann who had just founded her Institute for Demoscopy.15)Letter from Yvonne Schaper to Elisabeth Noelle-Neumann, Princeton, July 1, 1947, Private Archives Elisabeth Noelle, Piazzogna. Throughout their lives, Yvonne and Woelf Schaper stayed in close touch with Elisabeth Noelle-Neumann and her family. 1. ↑ Family chronicle by Eva Noelle, Private Archives Elisabeth Noelle, Piazzogna. 2. ↑ Résumé of Dr. Ernst Noelle, undated, Private Archives Elisabeth Noelle, Piazzogna. 3. ↑ Hoffmann von Fallersleben: “Aus eines Ritters Haus…” (handwritten and signed poem dedicated to Emil Rittershaus), Bielefeld, July 18, 1869, Private Archives Elisabeth Noelle, Piazzogna. 4. ↑ Elisabeth Noelle-Neumann: Die Erinnerungen (pp. 14-15). Herbig, Munich 2006. 5. ↑ The meeting at the residence of Chancellor Kohl and the archival research are mentioned in: Letter from Prince Louis Ferdinand of Prussia to Elisabeth Noelle-Neumann, Bremen, April 27, 1989, Private Archives Elisabeth Noelle, Piazzogna. 6. ↑ Photographs of Elisabeth Noelle-Neumann visiting Prince Louis Ferdinand of Prussia on Hohenzollern Castle as well as the KPM service are kept in the Private Archives Elisabeth Noelle, Piazzogna. 7. ↑ Elisabeth Noelle-Neumann: Der grosse Garten in der Limonenstrasse 8. Politik bestand aus Wahlplakaten und Fahnen – Aber Modernsein hatte einen Zauberklang. In: Rudolf Poertner (Ed. ): Alltag in der Weimarer Republik. Erinnerungen an eine unruhige Zeit (pp. 515-520). Econ, Duesseldorf/Vienna/New York 1990. 8. ↑ See biography of Dora Lux, Yvonne Schaper’s sister: Hilde Schramm: Meine Lehrerin, Dr. Dora Lux. 1882-1959. Nachforschungen (p. 201). Rowohlt, Hamburg 2012. 9. ↑ Report by Peter Wolfgang Schaper (copy of an 8-page typescript written in German), Berlin-Friedenau, January 1945, Private Archives Elisabeth Noelle, Piazzogna. 10. ↑ Yvonne Schaper described her liberation in an unfinished and unsent letter written in French to her sister Annemarie “Mieze” Bieber who lived in the U.S.: Letter from Yvonne Schaper to Mieze Bieber (copy), Wiesbaden, May 11, 1945, Private Archives Elisabeth Noelle, Piazzogna. 11. ↑ Photos by Eric Schwab and a report on his activity may be found on the website of the French Press Agency: Yves Gacon: Eric Schwab: Photographing the unspeakable. AFP, Paris 2015. 12. ↑ Meyer Levin: In Search – An Autobiography (pp. 223-275). Constellation Books, London 1951. 13. ↑ Meyer Levin’s and Eric Schwab’s trip across Europe was recently redescribed in: Annette Wieviorka: 1945 La Découverte. Editions du Seuil, Paris 2015. 14. ↑ Hilde Schramm: Meine Lehrerin, Dr. Dora Lux. 1882-1959. Nachforschungen (pp. 200-202; 272-274). Rowohlt, Hamburg 2012. 15. ↑ Letter from Yvonne Schaper to Elisabeth Noelle-Neumann, Princeton, July 1, 1947, Private Archives Elisabeth Noelle, Piazzogna. Thomas Petersen et al. © 2016. All rights reserved.